Admission to almost everything is free, which is by design. Two hours before the NIT championship game, Chris Del Conte was busy shaking hands and taking photos with Texas fans in the basement of Stout, the official bar of New York-based Texas Exes. 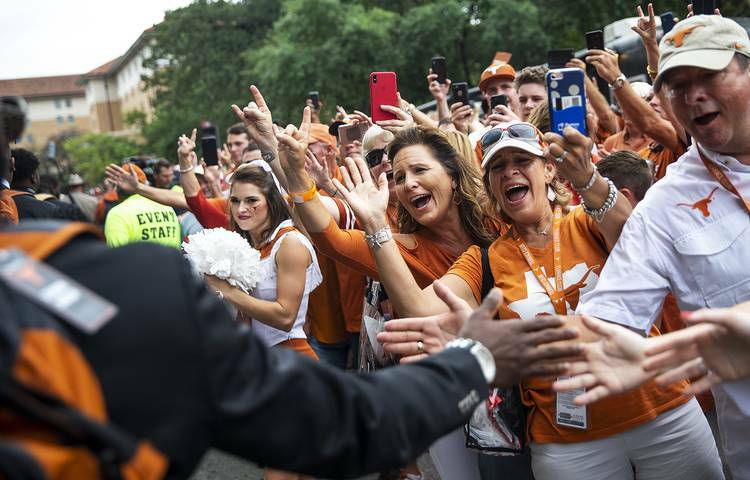 That kind of thinking, this idea of targeting each fan’s baseline emotional connection to the school, is how administrators want to market Texas athletics going forward. This weekend isn’t about Saturday’s Orange-White spring game, at least not in Del Conte’s mind. UT has labeled the three days “Made in Austin” — a virtual burnt-orange carnival designed to promote the athletic department and give fans a chance to experience that feeling of fall Saturdays here in mid-April. Forget about the wins and losses. In athletic department officials’ minds, there’s only one key question: Did you have fun? The baseball team has a three-game series at home against Kansas State. The women’s soccer team has two exhibition matches. Texas will stage 5K and 10K runs on Saturday morning through the campus. Oh, and the football team will have a “game,” which is really more like a practice, inside Royal-Memorial Stadium. Admission to everything is free, except for the baseball tickets since it’s a regular-season game. Sunday’s series finale at UFCU Disch-Falk Field is the “Bark in the Park” where fans can bring their dog. It’s also a massive recruiting weekend for football coach Tom Herman. To lure athletes from all over, there’s a post-game concert by rapper Ludacris on the LBJ Lawn at approximately 10 p.m.
Don’t think there’s not competition here, too. Oklahoma and Texas A&M will have their spring games on Friday night. Recruits can spend the weekend in those towns or hustle to Austin. Um, the 43-year-old suburban dads may need to head back to the hotel. Let the kids go “Ludaversal.” Then again, “Rollout (My Business)” actually rolled out in 2001, before some of today’s recruits were even born. Gen-Xers and millennials should be OK. There is something for everybody this weekend, and that’s the point, UT officials said. Former athletic director Steve Patterson was ridiculed in 2015 after he took UT administrators to the Disney Institute in Orlando, Fla. What do line queues and trash can spacing have to do with Texas athletics, old-school critics scoffed. Del Conte believes in the Mouse’s teachings but, to be frank, pulled it off with better execution. Bevo Boulevard, which featured Bevo XV’s entrance, a band parade and player walk, was a wild success during its initial season in 2018. Fans (read: students) could attend a pre-game concert on the LBJ Lawn. There were fewer advertisements on the video board and lower prices at the concession stands. Sure, a 10-win season capped with a Sugar Bowl win helped. But little things, like shoving the opposing team’s fans upstairs and moving UT fans closer, were instrumental, too. “You know what you didn’t hear during the USC game? ‘Fight On,’” Martin said of USC’s fight song. So how can UT athletics tug at fans’ heartstrings long after people go home? Look at the season ticket brochure for answers. The 2019 Texas football season ticket brochure features multiple photos of fans and the gameday experience. Image courtesy of Texas athletics. Texas, like most schools, would send out glossy ticket renewal pamphlets that measured 8 1/2 inches wide and 11 inches tall. It would feature player and coach photos, photos from the Texas-Oklahoma game and other shots of DKR. This year, fans received an oversized brochure measuring 10 3/4 inches wide and 13 1/2 inches tall. The cover has an understated title, “Celebrate Texas,” with a terrific shot of UT fans celebrating a Collin Johnson catch. Open it up — think of old vinyl records that opened to reveal liner notes — and there are photos from Bevo Boulevard, the concerts and a huge shot of the west side stands during the “Don’t Stop Believin’” flashlight timeout against Iowa State. There’s not one photo of actual game play. The “Celebrate Texas” theme will run through all of UT’s marketing for the upcoming athletic year. Martin said fans will receive the 2019 football schedule poster for an autograph session after the spring game. Typically, those aren’t released until August practice. Del Conte, Martin and Herman all want fans getting excited about Longhorns football right now. The school is already at a 95-percent renewal rate for season tickets, which is about 54,500, Martin said. The record was more than 60,000 season tickets sold for the 2010 season. “Don’t think for two seconds I don’t have a cannon aimed at it,” Martin said. 6:30 p.m. — Orange-White spring game, Royal-Memorial Stadium. Autograph session afterward on the field.